In 1834, William A. Knight, Levi J. Knight, Hamilton W. Sharpe, John Blackshear, John McLean, John E. Tucker, William Smith led the effort to form a State Rights Association at Franklinville, GA, then seat of Lowndes County. Lowndes, at that time included most of present day Berrien County, and the community settled by Wiregrass pioneer Levi J. Knight which would become known as Ray City, GA. 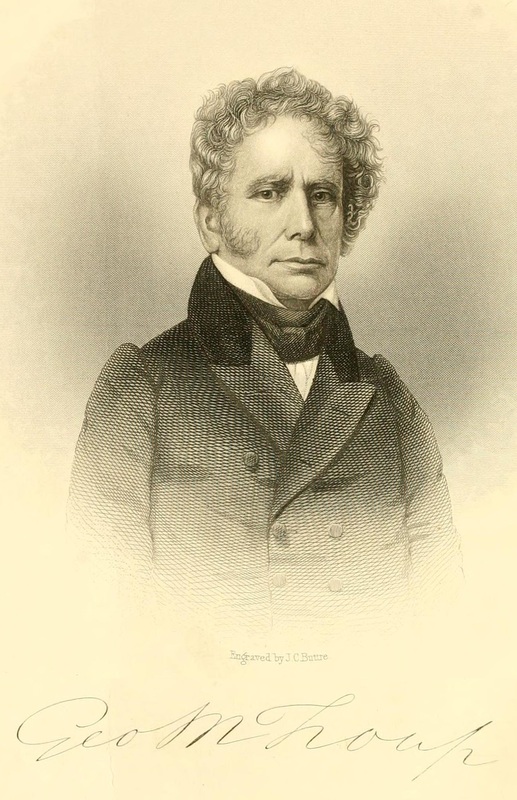 The following year, the citizens of Lowndes again met to toast States Rights at Franklinville on Independence Day(1835) In 1836, they would designate their new county seat as Troupville, in honor of “the great apostle of state rights,” George M. Troup. The State Rights Party of Georgia had been launched in 1833 by prominent leaders of the Troup party, including John M. Berrien, George R. Gilmer, William H. Crawford, William C. Dawson, and Augustin S. Clayton. The State Rights activists were committed to the notion that individual states could exercise nullification of federal laws which they found objectionable, although this doctrine was condemned by the Legislature of Georgia and other state governments. Furthermore, according to the State Rights supporters, individual states where bound by the Constitution only to the extent that they found agreeable; states could secede from the Union at will. These ideas emerged in response the Alien and Sedition Acts – a sort of 17th century version of the Homeland Security Act – which the Federalists enacted as war with France loomed on the horizon. The infringements of the Alien and Sedition Acts had prompted Thomas Jefferson and James Madison to secretly author the Kentucky (1798) and Virginia (1799) Resolutions which first proposed the argument that state legislatures had the right to nullify Federal statutes. In these resolutions lay the seeds of disunion which culminated in the Civil War. The 1834 convening of the State Rights activists in Lowndes County was full of rhetoric over the Virginia and Kentucky Resolutions, South Carolina’s attempts at nullification, Andrew Jackson’s Nullification Proclamation which disputed a states’ right to nullify federal law, and the subsequent Force Act, which authorized the use of military force against any state that resisted federal law. According to previous arrangement, the citizens of Lowndes county friendly to State Rights met in Franklinville on the 4th of July, for the purpose of forming a State Rights Association – when, on motion, Wm Smith was called to the Chair, and John McLean appointed Secretary. The object of the meeting was then explained by Hamilton W. Sharpe, Esq. A committee of five persons, to wit: H. W. Sharpe, John Blackshear, John McLean, John E. Tucker, and Levi J. Knight, was appointed to draft a preamble expressive of the political sentiments of the meeting, and a constitution for the government of the association. The meeting then adjourned until Friday the 1st day of August. THE STATE RIGHTS PARTY OF LOWNDES COUNTY, met pursuant to adjournment, on the first day of August, when Wm A. Knight was appointed President, Matthew Albritton and John J. Underwood Vice President, and William Smith recording Secretary and Treasurer. A committee of three persons was appointed to wait on the President, notify him of his appointment, and conduct him to the chair, after which he addressed the meeting at considerable length. The preamble and Constitution being called for, H. W. Sharpe, from the Committee, reported the following, which was unanimously adopted. This meeting, which is called in conformity to the request of the State Rights meeting which was formed in Milledgeville on the 13th Nov. last, is deemed by your committee to be of the utmost importance, in producing unanimity of action in suppor of these great conservative principles of State Rights hitherto of such great importance in prostrating the approaching spirit of consolidation. The triumph of those principles so much to be desired, calls loudly for the formation of local and county associations, as the best means of disseminating those great political truths maintained by the illustrious Jefferson, affirmed by the Virginia and Kentucky resolutions, and sanctioned by the purest patriots of our country. The state of political parties in Georgia, and throughout the Union, calls loudly for this concert of action to preserve all that is dear to freemen. There seems to be a spirit abroad in the land, which is likely to fatal to constitutional liberty, and subversive of the Republican doctrines of ’98 and ’99; and in their place is sought to be established antagonist doctrines, calculated to change our political institutions, & destroy our civil rights. If these doctrines should prevail, then farewell to freedom and State Sovereignty. Then will the altar of our political faith be destroyed, and its glories extinguished. Our opponents, to wit, the self-styled Union party of Georgia, would dissemblingly profess to accord with the views of the illustrious Jefferson, and hypocritically pretend to adopt, as the rule of their faith, the Virginia and Kentucky resolutions of ’98 and ’99. They must have forgotten that those far-famed resolutions declare: “That there being no common judge, each party has a right to judge for itself, as well as of infractions as the mode and measure of redress.” Now this is the doctrine which we profess to believe; this then would have been the State Rights doctrine of the Union party, if they had gone no farther; but in a subsequent Resolution, they declare that in case Congress should pass an unconstitutional law, no State has a right to judge any thing about it. How this last sentiment can be made to agree with the Virginia and Kentucky Resolutions, we leave our opponents to determine. It is plainly deducible from the whole tenor of their proceedings, that the ultra-Federal doctrines of the Proclamation of the fatal 10th Dec. 1832, are approved and cherished. The tyrannical and despotic provisions of the Force Bill are sanctioned, its authors and supporters applauded, and the sovereignty of their own State denied. Then if these doctrines should eventually prove successful, it must result in the final overthrow of constitutional liberty, and the establishment of a consolidated despotism on the ruins of State Sovereignty. While our opponents are thus actively and zealously engaged in disseminating and circulating these dangerous doctrines, they spare no pains in casting odium and reproach on those of us who are friends to State Rights and State Sovereignty. The terms “rebel, ”disunionist, ”traitor’ and other opprobrious epithets, are frequently applied to those who would exert their influence to arrest the Federal Government in its march towards absolute power and despotism. We, as a portion of the State Rights party of Georgia, would cast back these epithets, and say, let posterity judge who are the friends of the Union and liberty, when the transactions of the present day shall become matters of history. We will now give our opinion of some of the leading political subjects, which seem to be the divisional line between the two parties now in Georgia. We believe the doctrines of the Proclamation of the 10th Dec. 1832 to be radically wrong, and will have a tendency to destroy the original principles of our government, for it re-asserts the doctrines of the Federalist of former days; “That the States of this Confederacy never had a separate existence; that a State has no right to decide upon the constitutionality of any act of Congress, nor to arrest its progress in its own limits. It denies the right of secession, even under the most oppressive laws, maintaining that the states have not retained their entire sovereignty, and that the allegiance of our citizens is due to the United States in the first instance, and threatening the employment of the sword and bayonet to coerce a State into submission. The passage of the Act called the Force Bill to be a high-handed measure, unauthorized by the Constitution. The President, overlooking his former principles, demands of a submissive Congress, their sanction of these extraordinary powers and doctrines, and the means of carrying them into effect. On no former occasion has the hand of power been exerted over the Constitution of a free country with more daring assumption. In has, under the pretence of collecting the Revenue, at one fell swoop abolished the State governments, conferred upon the President unlimited powers, and placed at his disposal the Army, Navy, and Militia of the United States, not only to be used at his own caprice, but also authorizes him to confer this power on a deputy Marshall, or whoever he may think proper. It also give him the power to make a Custom house on a ship of war, and place it at the entrance of any harbor he amy think proper, there to exact at the mouth of a cannon, in the name of duites, the honest earnings of the laboring man, and bestow the money as a bounty upon the lordly manufacturer. The provisions of this act are a disgrace to our Statute Book, and a monumnet of the servile spirit of the 22d Congress, and should be torn from our public archives and consigned to the flames that consumed the records of the Yazoo speculation. Your Committee, however, can but hope, that there is yet a redeeming spirit among the people of this Government, to check the rapid strides of absolute power which is threatening our institutions with a change from a Republic to a Despotism. In order that the doctrine of State Rights and State Remedies may be promoted, we, its friends and advocates of the county of Lowndes, think it the utmost importance to organize an Association to act in concert with the Central Committee and all Associations of a similar kind. Therefore, be it resolved, That it is expedient to form a State Rights Association based upon the doctrines of the Virginia and Kentucky Resolutions of ’98 and ’99, as put foth and contended for by Mr. Jefferson adn other republicans of that day. Art. 1. This Association shall be known as the State Rights Association of the county of Lowndes, and have for its object the dissemination of sound political doctrine, based upon the Republican doctrine of ’98 and ’99, as put forthe by Mr. Jefferson and other patriots. Art. 2. The offices of this Association shall be a President, two Vice Presidents, and a Secretary, who shall also act as Treasurer. Art. 3. The President shall perform the duties which appertain to such an office in all Associations of a similar kind, and shall call meetings of the Association and appoint Committees; and in his absence, one of the Vice Presidents shall preside. Art. 4. The Secretary shall keep a correct account of the proceedings of the Association. Art. 5. Any person may become a member of this Association by signing the Constitution. Art. 6. This Constitution may be altered or amended by two thirds of the Association, at any annual meeting. Art. 7. The officers of this Association shall be elected on the 4th of July in each and every year, unless it fall on the sabbath, the the Saturday preceding. Resolved, That the State Rights papers in Milledgeville be respectfully requested to publish the preceedings of this meeting. Resolved, That the Editors of the Southern Recorder be directed to print one hundred copies of the Preamble and Constitution adopted by this Association for distributing among the people of this county, and forward their account for payment to the Recording Secretary. The Association adjourned to meet at Franklinville, on Friday before the first Monday in October next.